Tag line: "Below the city of lights exists a world of darkness"
“Paris… the City of Lights. Perhaps the most romanticized city in history. Its grand boulevards and crowded sidewalk cafés are known the world over. But just a hundred feet beneath the City of Lights exists a lesser-known world. A world of darkness. The Empire of the Dead”. These are the opening lines of 2007’s Catacombs, a horror / thriller directed by Tomm Coker and David Elliot, and while the setting, aka the Paris Catacombs, is, indeed, creepy as hell, the movie itself is only fitfully so. Housing the remains of some 7 million dead, the Paris Catacombs stretch for miles underneath the city, with skulls and skeletons, stacked one of top of the other, nearly every step of the way. Some who dare to venture inside get themselves so lost that they’re never heard from again. In Catacombs, we meet a few brave souls who do more than just descend into this mass graveyard; they throw a party there! Organized by Jean-Michel (Mihai Stanescu), Hugo (Cabral Ibacka), and Nico (Radu Andrei Micu), the catacomb raves are the talk of the underground scene. The police (sometimes referred to as the “cata-cops”) have been trying to shut these parties down for months, so, to keep them hidden, the raves are never held in the same location twice. Victoria (Shannyn Sossamon), a shy, somewhat reserved American, is invited to Paris by her sister, Carolyn (played by singer/songwriter Pink), a student at the Sorbonne. In an attempt to help Victoria break out of her shell, Carolyn introduces her to Jean-Michel and the others, then drags her along to one of their raves. During the course of the party, Jean-Michel tells Victoria about the legendary “Goat-man”, the supposed anti-Christ born and bred in the Catacombs, stalking anyone who dares enter this abyss. When Carolyn and the others go skinny-dipping in a flooded underground mine, Victoria, who refuses to join them, decides to rejoin the party. Fearing she’ll get lost, Carolyn catches up to Victoria, and as the two search for the way back, they’re attacked by the “Goat Man”. Carolyn is killed outright, and Victoria, hoping to avoid the same fate, runs deeper into the catacombs, all the while screaming for help. But nobody’s around to hear her, and the further she runs, the less likely it is that she’ll ever be found. Star Shannyn Sossamon (who doubles as the narrator) delivers a gripping performance as the oft-frightened Victoria, and some of the film’s earlier scenes pack a pretty good punch; Jean-Michel’s telling of the Goat-Man legend, mixed with rapid-fire footage of the creature’s birth and upbringing, is fairly chilling, as is the first attack, during which Victoria, while trying to escape, runs straight into the Goat Man’s lair (one of the movie’s most intense sequences). These moments, combined with its eerie location, get Catacombs off to a strong start. The problem is all of the above happens before the movie's halfway point! From then on, the majority of the film is dedicated to following Carolyn on her trek through the catacombs, from which there seems to be no escape. She’s not alone the entire time; along the way, she meets up with Henri (Emil Hostina), a fellow reveler who’s also lost, yet, for a while, it looked as if Carolyn’s dilemma was never going to end, and as a result, I found my attention waning. After a promising start, the movie had suddenly fallen into a rut, and I couldn’t shake the feeling that Messrs. Coker and Elliot were more interested in padding the film’s running time than in moving things along. 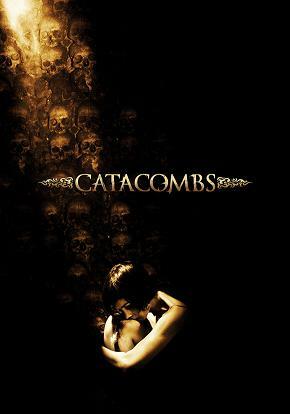 The movie does perk up a bit at the end (thanks to a surprising twist that I didn't see coming), but this doesn’t change the fact that, at its core, Catacombs is a solid, entertaining short stretched into a mediocre feature-length film.